Create the most stable environment for your plants, herbs and vegetables to thrive year round! The accessories listed below will help you create the most energy-efficient and successful growing environment for your home greenhouse kit. Please fill out the form below. Fields marked with * are required. STEP 2: Will You Be Attaching Your Greenhouse to a Knee Wall (Our standard kneewall height is assumed to be 28")? Please Note: Foundation dimensions vary with different gable end applications. 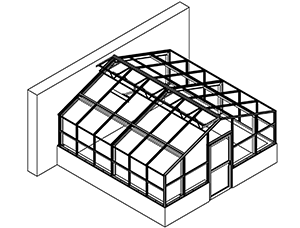 Do not pour your foundation until you receive a complete set of drawings from National Greenhouse. Be sure to consider your existing structure/gutter overhang when determining your length and width dimensions. STEP 11: Where Did You Hear About Us?